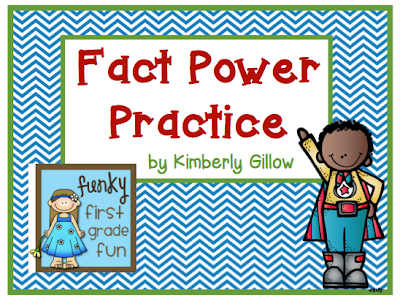 Funky First Grade Fun: Fact Power! Dunnuh nunnuh nunnuh nunnuh nunnuh nunnuh FACT POWER! Wow, that was hard to type and who knows how ya spell all that? My students are working on developing fact fluency for addition and subtraction facts up to 18. Each of my students has their own Fact Power Folder to help them practice. I'm not sure if it's the superhero theme or cute little folders we made, but my students are more motivated than ever to develop Fact Power! Here is a picture of the front of one of our Fact Power Folders. I use regular 2 pocket folders. to practice the facts are included in my Fact Power Folder Set. *The actual folders are not included. You can click on the image below if you'd like to check it out. This set and everything else in my Tpt store will be 20% off on Thursday, 2/27 and Friday, 2/28! Don't forget to use the code TPT3 for extra savings when you shop on those two days!